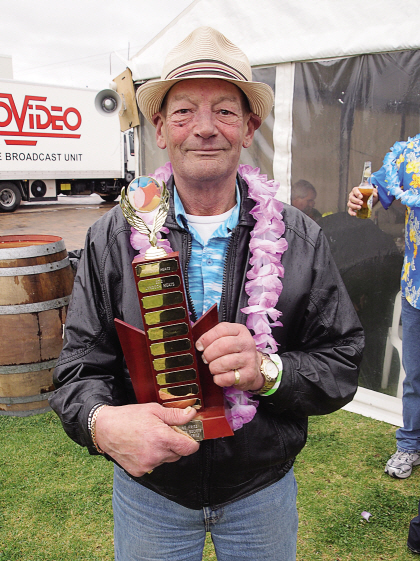 OUR INAUGURAL ANNUAL RACE DAY has been and gone… Full Bore $3.20 was triumphant in winning the inaugural South Australian Bung Fritz Club Rating 0-68 Handicap ( Bung Fritz Cup) of 1511 metres. A good day was had by all and special thanks to the Bung Masters for organising this major event. A very good turnout by members and friends. Most in their Hawaiian shirt. Great food, hospitality and Jacob’s Creek wine. A good field of racing. Our special guest, Johnny Letts, who did a sterling job with our Punter’s Club – and he was award our Membership #1. Members and the Punter’s Club – see below. Our group was never about money. It originated for selected people to enjoy good food and good company. To say I was disappointed with the furore over our poorly run “PUNTERS’ CLUB “ would be an understatement. was formed. We had over 80 people at times in our marquee. Who contributed? Who didn’t? Who knows? Who cares? I have decided that after expenses (a profit and loss sheet will be available) the balance will be donated to the “Henk van Oosterom” fundraiser being held at the Kingsford Hotel, Sat.20th October. I believe this is good for Gawler (of which we are all part) and the South Australian Bungfritz Appreciation Society. As this may not please everyone, I am prepared to reimburse anyone who wishes, with their $10 plus the $50 for the day, upon the return of their badge. LIFE IS TOO SHORT TO BE PETTY. I’m in Murray Bridge… any specialist Bungers down this way ? Thank’s Father for the BF race day, all that I saw who attended looked to have a good outing. A donation is what it should be and should have been for the punters club. I assumed that was what it was. Good on Lettsy for a top run of picks that tripled the pot. He’s still a legend. It is a shame that some would try to profit from what is a non profit and charitable organisation. (Go figure???? ).